The technical aspects and clinical applications of this approach. Visceral artery incorporation using fenestrations and directional branches has gained widespread acceptance. Multiple clinical series and systematic reviews have shown high technical success rates and lower morbidity and mortality rates compared to historical open surgical reports. Characteristics of an ideal visceral branch include short length, long overlap with the aortic attachment site, and vector alignment with the target artery. Although fenestrations allow the placement of short, transversely oriented alignment stents that result in low occlusion rates, disconnections and associated type III endoleaks limit its use for branch vessels that originate from a large aortic lumen. In this scenario, directional branches provide a longer overlap between the bridging stent and the attachment site, minimizing the risk of disconnections and type III endoleaks. This article summarizes the anatomical criteria, techniques of implantation and results obtained with the Zenith t-Branch multibranched stent graft* (Cook Medical) for the treatment of thoracoabdominal aortic aneurysms (TAAAs). The t-Branch stent graft consists of a tapered woven polyester stent graft sutured to a stainless steel Z-stent exoskeleton. The mid-portion of the device contains four short (18 mm) axially oriented, caudally directed cuffs for attachment of covered stents, which serve as the branches for visceral vessel incorporation. The cuffs are situated in the external surface of the stent graft, and their positions are based on predictable locations of the visceral vessels as depicted in Figure 1. The device has a diameter of 34 mm at the top and 18 mm at the bottom, with a length of 202 mm. The celiac artery and superior mesenteric artery (SMA) cuffs are each 8 mm in diameter and are axially located in the 1 and 12 o’clock positions, respectively. The right and left renal artery cuffs are each 6 mm in diameter and are located in the 10 and 3 o’clock positions, respectively. The device is delivered through a 20-F system. 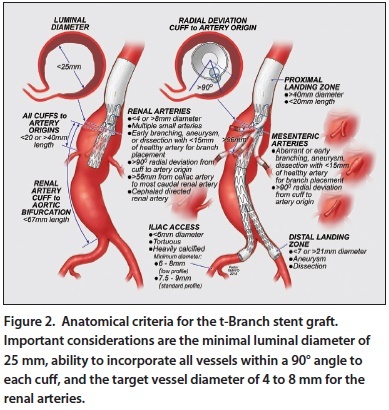 Anatomical feasibility of the t-Branch stent graft has been assessed in a few studies. Sweet et al1 evaluated aortic anatomy in 66 patients treated by multibranched stent grafts. 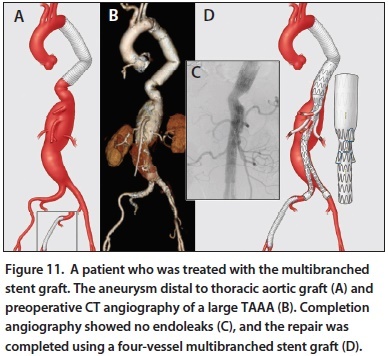 In that study, 88% of patients met all of the anatomical criteria proposed in Figure 2, suggesting that a standardized multibranch stent graft has wide applicability. Park et al2 analyzed the shape and length of branches in a patient series treated with patient-specific multibranched stent grafts. Although all of the branches were inserted as intended and without migration, disconnection, or kink, 23% of the branches had > 30° misalignment, suggesting that the design was quite forgiving for errors of implantation or variations in patient anatomy. A follow-up study by Gasper et al3 analyzed the applicability of multibranched stent grafts in a broader study population of 201 potential candidates for repair of TAAAs. Anatomic suitability was assessed for patient-specific or an off-the-shelf version with either a standard (22 F) or lower-profile (18 F) device. Of the 201 patients, 58% were candidates for repair in a single-stage procedure, and another 29% could be candidates for repair with adjunct procedures to provide a suitable landing zone. Women were significantly more likely to require a conduit, which was less frequently needed with the lower-profile design. Patients with chronic dissections were significantly less likely to qualify for repair due to involvement of the iliac arteries, compressed true lumen, or aberrant vessel anatomy. Although the off-the-shelf design has the advantages of eliminating the need to wait for customization, only 94 patients (< 50%) qualified for the use of this device. Variations in target vessel configuration remain the main limitation to widespread use of off-the-shelf multibranched designs. Conway et al4 evaluated the angles of implantation of the renal arteries according to different aneurysm anatomies. In that study, patients with a predominance of abdominal disease (type IV TAAA) more often had a downward orientation of the renal arteries as compared to those with a predominance of thoracic disease (types II and III), who more often had a neutral or “up-going” configuration. Incorporation of up-going renal arteries with down-going branches is not ideal and may lead to kinking, stenosis, or branch thrombosis. Conversely, down-going branches are very well suited for vessels with a down-going configuration, which is frequently the case for the celiac axis and SMA. Our approach has been to individually adapt the best design to the patient anatomy, whenever possible, with the use of directional branches and/or fenestrations in patient-specific or off-the-shelf designs. Spinal cord injury is the most devastating complication of endovascular TAAA repair. We have adopted a standardized approach, which includes the following measures. Vasodilator antihypertensive medications are discontinued or decreased in dose a week prior to the operation through up to 4 to 6 weeks after the procedure. A mean arterial pressure (MAP) of ≥ 80 mm Hg is targeted intraoperatively and for the first 72 hours. If there are changes noted in neuromonitoring or the physical exam, MAP goals are raised to 100 mm Hg. Transfusion of blood products is indicated in the first 48 hours after the procedure to maintain a target hemoglobin level of ≥ 10 mg/dL and a normal coagulation profile. Routine, prophylactic cerebrospinal fluid (CSF) drainage is used in all patients with a pressure control system and a baseline spinal pressure of 10 mm Hg. If there were changes in neuromonitoring or the physical exam, the CSF pressure is decreased to 0 to 5 mm Hg. Spinal fluid drainage is continued for 24 hours in patients with type IV TAAAs and for 48 to 72 hours in those with type I to III TAAAs. Early lower limb reperfusion is used whenever possible. Temporary iliac artery conduits are indicated in patients with small iliac arteries. Femoral conduits anastomosed end-to-side to the common femoral artery have also been selectively used to allow restoration of lower extremity flow in patients with challenging anatomy or severe internal iliac and femoral artery disease. 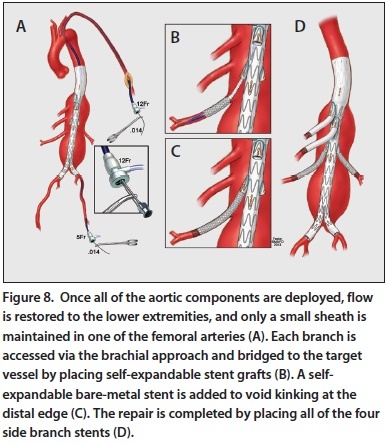 The use of femoral conduits minimizes lower extremity ischemia during visceral branch stenting by allowing the aortic device sheath to be retracted into the conduit. Intraoperative neuromonitoring is routinely used in all patients to trigger specific maneuvers depicted in Figure 3. A > 75% consistent reduction from baseline in the evoked potential amplitude triggers standardized maneuvers to optimize lower extremity and spinal cord perfusion, including incremental changes in MAP and CSF pressure. The MAP is raised with vasopressors along with a simultaneous decrease in CSF drainage pressure. In patients who improve after the maneuvers, the procedure is completed in a standard fashion. In those with no change or deterioration, flow is restored to the pelvis and lower extremities as quickly as possible. In patients with normalization of evoked potentials after lower extremity flow is restored, the procedure is completed. If the changes persist, the procedure is left incomplete by leaving either the celiac branch or contralateral iliac limb open, whenever possible. A staged endovascular approach has been used in all patients with type I or II TAAAs. The most common technique is coverage of the thoracic aorta up to the celiac axis in the first stage of the procedure, followed by completion of the endovascular repair using a thoracoabdominal fenestrated and/or branched stent graft 6 to 8 weeks later. These procedures require advanced endovascular skills and a comprehensive endovascular inventory with a wide range of catheters, balloons, and stents. Dedicated training in fenestrated and branched techniques is highly recommended for physicians who are already very experienced with other types of endovascular procedures. Preadmission should be considered in patients with chronic kidney disease (estimated glomerular filtration rate < 60 mL/min/1.73 m2), advanced age, and very complex anatomy. Patients undergo gentle bowel preparation, intravenous hydration with bicarbonate infusion, and oral administration of acetyl-cysteine. Acetyl-salicylic acid is started or continued prior to the operation, but clopidogrel is discontinued at least 10 days beforehand. Patients are instructed to shower with liquid skin cleanser (chlorhexidine gluconate 4%) the day prior to the procedure to reduce bacterial counts. In obese patients, the skin over the groin crease needs to be inspected several days before the procedure, and any fungal infection is treated. Antibiotics are intravenously administered prior to the incision and continued up to 24 hours after the procedure. Optimal imaging is recommended using a hybrid endovascular suite with a fixed imaging unit and, ideally, fusion cone-beam capability. Most procedures are performed using general endotracheal anesthesia, although select cases can also be done under local or regional anesthesia. Intraoperative blood salvage (“cell salvage”) may be considered if one anticipates difficulty or a prolonged operating time. A useful tip is to create large pockets within the surgical drapes to allow for the blood to be collected via cell salvage. The use of iodinated contrast is minimized throughout all of the steps of the procedure. Our preference has been to use small hand injections of 10 mL of diluted contrast at 30% (3 mL of contrast in 7 mL of saline) to locate the side branches. Completion aortography is performed after all of the stents are placed, with the use of diluted contrast at 50%. 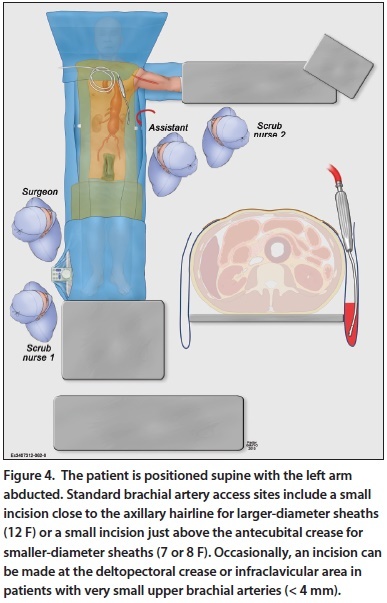 Patients are positioned supine, with the left arm abducted and the imaging unit oriented from the head of the table (Figure 4). Arterial access most often includes a bilateral femoral and left brachial approach. Just prior to prepping the patient, the brachial artery is imaged to select the incision site, which is typically high in the axilla, unless the artery is small (< 4 mm); in these cases, exposure is performed at the infraclavicular fossa. Electrocardiography leads, the urinary catheter, and other monitoring cables and lines should be taped or secured so that they are not in the path of the x-ray beam of the fluoroscopic unit or do not get caught during movement of the C-arm gantry. Percutaneous bilateral femoral access is used in all cases, whenever possible, except for in patients with high femoral bifurcations, dense calcifications, or anterior plaque. The concept that percutaneous access leads to prolonged time of lower extremity ischemia is misleading and erroneous. In fact, we immediately remove the sheaths and tighten the sutures without tying the knots, once all of the steps are completed via the femoral approach. This allows restoration of flow to the lower extremity faster than with primary arterial closure. Access can be done by reintroduction of the sheath using the guidewire, if needed. We have not experienced any significant bleeding complications or hypotension related to access issues. The patient is systemically heparinized with an intravenous bolus of heparin (80–100 units/kg), which is administered immediately after the femoral and brachial access is established. The activated clotting times are rechecked every 30 minutes, and additional heparin needs to be administered if the activated clotting time is < 250 seconds. A continuous drip of heparin (500–1000 units/h) is also started, and diuresis is induced with intravenous mannitol and/or furosemide. The sequence of steps for stent deployment can vary slightly depending on the proximal extent of the aneurysm. In general, the repair starts with deployment of a proximal thoracic TX2 stent graft (Cook Medical), if needed, followed by deployment of the t-Branch stent graft. One of the advantages of using directional branches is that there is room to use selective catheters between the cuffs and target vessels; therefore, implantation does not need to be performed with the extreme degree of precision that is required with fenestrated stent grafts. Our preference is to deploy the distal bifurcated component and limb extensions, leaving placement of the bridging self-expandable stents as the last step of the procedure after closure of the femoral arteries. A modification of this technique—staggered deployment—may be needed in difficult cases with a narrow aortic lumen. Precatheterization of the renal arteries is typically not needed. However, it is critical that the distal edge of each of the branches is deployed 1.5 to 2 cm above its intended target vessel (Figure 5). Ideally, the minimum internal aortic diameter should be > 25 mm to allow space for catheter manipulation. Review of the anatomy is important to understand the lengths and clock positions of the branch vessels. For example, the device may need to be somewhat rotated during deployment to better align the renal cuffs in relation to the renal arteries. To guide deployment of the t-Branch component, we usually catheterize one of the vessels. 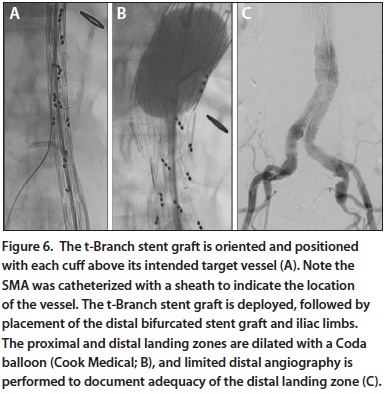 The t-Branch stent graft is oriented extracorporeally, introduced via the femoral approach, and deployed with the directional branches located proximal to its intended target vessel (Figure 6). Next, the distal universal bifurcated stent graft and contralateral iliac extensions are placed. One important tip is to avoid aggressive dilatation of the aortic bifurcation in these patients because the aneurysm sac is still perfused, and inadvertent rupture of the aortic bifurcation can be catastrophic. The femoral arteries are closed at this point, restoring flow into the lower extremities. If the procedure is performed percutaneously, this can be done in an expeditious manner by leaving the guidewires in place along with a small sheath. A 12-F Ansel I sheath (Cook Medical) is advanced via the left brachial approach and positioned inside the t-Branch component in the descending thoracic aorta. 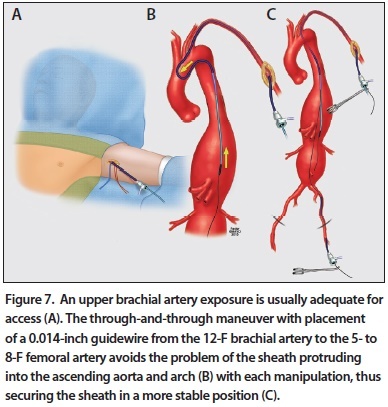 A 0.014-inch guidewire is then advanced with a through-and-through approach from the left brachial to femoral artery (Figure 7), preventing movement of the 12-F sheath in the aortic arch. Each side branch is individually catheterized in a sequential fashion, starting with the renal arteries (Figure 8) and followed by the SMA and celiac axis. A 5-F MPA or Kumpe catheter (Cook Medical) is used to access the directional branch and target vessel. Once the vessel is catheterized, the soft Glidewire (Terumo Interventional Systems) is exchanged for a stiff guidewire (Rosen or short-tip Amplatzer, Cook Medical), which is positioned in the target vessel. Before the stent is deployed, it is critical to confirm that the guidewire is placed into the correct cuff. This requires moving the imaging projection in different oblique views to visualize the guidewire and the cuff. A Rosen guidewire is used for the renal arteries. For bridging stents, our preference is to use Viabahn stent grafts (Gore & Associates) for the renal arteries (Figure 9) due to their excellent conformability and possibly superior patency rates. However, these stents are limited by their length being either too short (5 cm) or too long (10 cm), as well as difficult deployment. Therefore, one needs to be careful not to pull the stent out of the vessel during deployment. This can be prevented with slow deployment while leaving the sheath inside the proximal half of the stent, and then once the stent engages the vessel, the sheath is pulled, and the deployment is slowly completed. If the stent is too short or a 5-mm diameter is used, our preference is to use a proximal balloon-expandable covered stent to track the Viabahn device into the cuff. 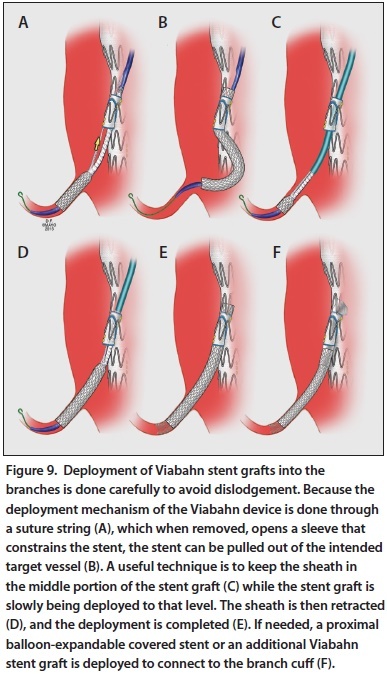 The distal edge of the Viabahn device is reinforced by placing a self-expandable bare-metal stent. This is followed by balloon dilatation of all stents to profile and, at last, completion angiography. 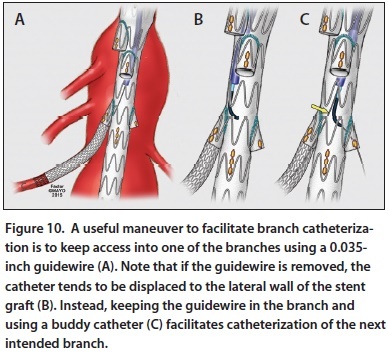 Catheterization of each cuff can be facilitated by keeping the stiff wire inside the branch (Figure 10) while working with a buddy catheter to catheterize the next intended target branch. As previously mentioned, it is critical to ensure that the catheter is in the correct branch before deploying the bridging stent. One can easily misjudge the SMA for the celiac cuff and place the stent into the incorrect branch, compromising the entire repair. 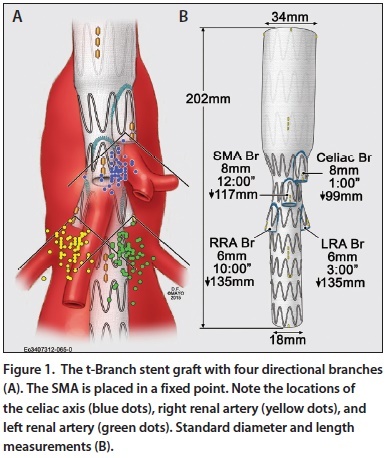 For stenting of the celiac and SMA, a 9-F, 70-cm Flexor sheath (Cook Medical) is advanced coaxially within the 12-F sheath. Each target vessel is stented with a self-expandable stent graft (Viabahn or Fluency, Bard Peripheral Vascular, Inc.). The stent graft should be oversized by 1 to 2 mm and should provide at least a 2-cm distal landing zone in the target vessel, extending 2 to 5 mm into the aortic lumen of the t-Branch device. Our preference is to use Fluency stent grafts for the celiac and SMA because of the smaller-profile sheath and larger-diameter stents with greater availability of lengths. To prevent kinks in the transition between the stent graft and the target artery, each self-expandable stent graft is reinforced by a second self-expandable stent, which is deployed 1 cm beyond the distal edge of the stent graft. Selective completion angiography is performed for each sequential branch. Next, completion angiography of the arch and thoracoabdominal aorta is performed after all bridging stent grafts are deployed. Figure 11 and Figure 12 illustrate a case in which a patient was treated with a multibranched thoracoabdominal stent graft. The choice between fenestrations and branches varies greatly between centers. Our preference has been to select patient-specific stent grafts with mixed configurations using directional branches and fenestrations. Renal fenestrations have an exceptionally low rate of occlusion compared to recent reports of multibranched stent grafts (< 2% and 7%–10%, respectively), but some disadvantages exist, including higher rates of type III endoleaks and branch disconnection, particularly when fenestrations are applied for renal arteries that originate from large aortic segments.5,7-9 In addition, patient-specific stent grafts require an average delay of approximately 8 weeks for customization, which is not ideal in patients with excessively large aneurysms (> 8 cm) and prevents their use in patients with symptomatic and ruptured aneurysms. 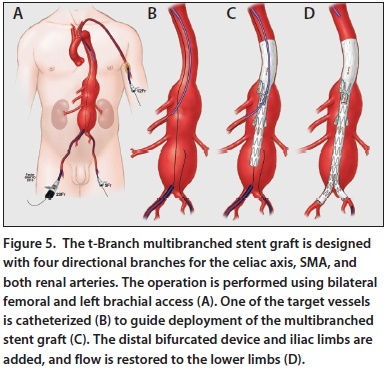 The t-Branch stent graft represents an evolution from the original multibranched design proposed by Chuter et al in 2001.10 It is estimated that > 50% of the TAAA population are suitable for the device in a single procedure, with even greater suitability with staged procedures.3 The most frequent limitations include inadequate renal arterial anatomy (small diameter, multiple accessory renal arteries, early bifurcation), difficult access, or lack of a proximal landing zone. Whereas some of the proposed anatomical criteria are flexible, such as the distance or angulation between the branch and the target, it is likely that these factors may affect branch-related events and reinterventions. Similarly, there is no agreement in terms of selection of the ideal bridging stent for branches. Investigators have used a wide combination of self-expandable stent grafts and balloon-expandable covered stents, with or without reinforcement with a self-expandable bare-metal stent. Selection of the bridging stent also likely plays a role in branch occlusion rates, although this has not yet been confirmed by convincing data. Our preference has been to use Viabahn stent grafts for the renal arteries with minimal (1 mm) oversizing because of its excellent flexibility; we often reinforce the distal transition point with a self-expandable bare-metal stent to prevent kinking. For the celiac and SMA, we use Fluency stent grafts because of its lower-profile sheath, larger-diameter stents, and wider availability of stent lengths. Fenestrated and branched stent graft techniques continue to evolve. Advantages of the t-Branch device include its wide clinical versatility and high technical success for repairing large TAAAs. Key technical points include extensive physician planning, case selection, and meticulous perioperative techniques. There have been important contributions from large clinical series, which demonstrate the benefit of staging extensive TAAAs and early restoration of lower extremity perfusion, whenever possible. *The Zenith t-Branch multibranched stent graft is an investigational device in the United States. Limited by United States law to investigational use. It is CE Mark approved with indications for use in the endovascular treatment of patients with an aortoiliac or iliac aneurysm, an insufficient distal sealing site within the common iliac artery, and having morphology suitable for endovascular repair. Gustavo S. Oderich, MD, is Professor of Surgery, Director of Endovascular Therapy, Division of Vascular and Endovascular Surgery at the Mayo Clinic in Rochester, Minnesota. He has disclosed that he has a consulting agreement with WL Gore and Cook Medical, with all fees paid to the Mayo Clinic, and receives research support from Cook Medical, Atrium Medical, and WL Gore, which also goes to the Mayo Clinic. He does not receive personal financial income from industry. Prof. Oderich may be reached at (507) 284-1575; oderich.gustavo@mayo.edu. Bernardo Mendes, MD, is Vascular and Endovascular Surgery Integrated Resident, Clinical Aortic Research Fellow, Division of Vascular and Endovascular Surgery at the Mayo Clinic in Rochester, Minnesota. He has stated that he has no financial interests related to this article. 1. Sweet MP, Hiramoto JS, Park KH, et al. 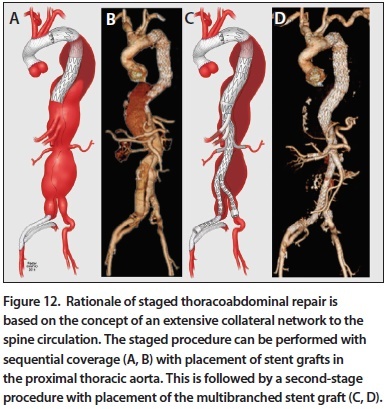 A standardized multibranched thoracoabdominal stent graft for endovascular aneurysm repair. J Endovasc Ther. 2009;16:359-364. 2. Park KH, Hiramoto JS, Reilly LM, et al. Variation in the shape and length of the branches of a thoracoabdominal aortic stent graft: implications for the role of standard off-the-shelf components. J Vasc Surg. 2010;51:572-576. 3. Gasper WJ, Reilly LM, Rapp JH, et al. Assessing the anatomic applicability of the multibranched endovascular repair of thoracoabdominal aortic aneurysm technique. J Vasc Surg. 2013;57:1553-1558. 4. Conway BD, Greenberg RK, Mastracci TM, et al. Renal artery implantation angles in thoracoabdominal aneurysms and their implications in the era of branched endografts. J Endovasc Ther. 2010;17:380-387. 5. Reilly LM, Rapp JH, Grenon SM, et al. Efficacy and durability of endovascular thoracoabdominal aortic aneurysm repair using the caudally directed cuff technique. J Vasc Surg. 2012;56:53-63; discussion 64. 6. Mastracci TM, Greenberg RK, Eagleton MJ, Hernandez AV. Durability of branches in branched and fenestrated endografts. J Vasc Surg. 2013;57:926-933. 7. Chuter T, Greenberg RK. Standardized off-the-shelf components for multibranched endovascular repair of thoracoabdominal aortic aneurysms. Perspect Vasc Surg Endovasc Ther. 2011;23:195-201. 8. Panuccio G, Bisdas T, Berekoven B, et al. Performance of bridging stent grafts in fenestrated and branched aortic endografting. Eur J Vasc Endovasc Surg. 2015;50:60-70. 9. Martin-Gonzalez T, Pincon C, Maurel B, et al. 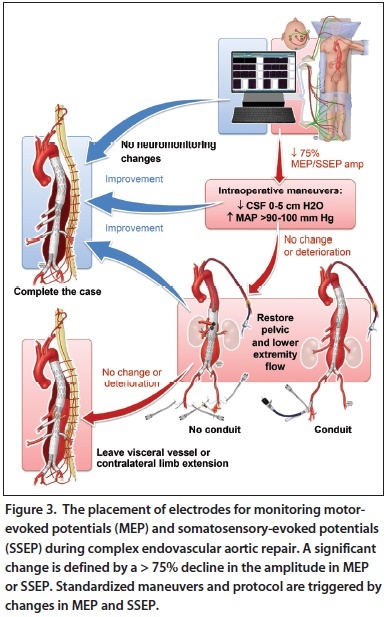 Renal outcomes following fenestrated and branched endografting [online ahead of print May 25, 2015]. Eur J Vasc Endovasc Surg. 10. Chuter TA, Gordon RL, Reilly LM, et al. Multibranched stent graft for type III thoracoabdominal aortic aneurysm. J Vasc Interv Radiol. 2001;12:391-392. 11. Bisdas T, Donas KP, Bosiers MJ, et al. Custom-made versus off-the-shelf multibranched endografts for endovascular repair of thoracoabdominal aortic aneurysms. J Vasc Surg. 2014;60:1186-1195. 12. Verhoeven EL, Katsargyris A, Bekkema F, Oikonomou K, Zeebregts CJ, Ritter W, et al. Editor’s choice—ten-year experience with endovascular repair of thoracoabdominal aortic aneurysms: results from 166 consecutive patients. Eur J Vasc Endovasc Surg. 2015;49(5):524-531. 13. O’Callaghan A, Mastracci TM, Eagleton MJ. Staged endovascular repair of thoracoabdominal aortic aneurysms limits incidence and severity of spinal cord ischemia. J Vasc Surg. 2015;61(2):347-354 e1. A review of changes in CPT coding for interventional procedures effective January 2016. A discussion of new stent graft designs for pathology of the thoracic aorta. Devices on the horizon that will allow near-total endovascular techniques to become a reality. A case description of a young athlete treated with mechanical thrombectomy and low-dose thrombolytics in a single session.